The big three (Daleks, Cybermen*, and the Master**) will always come back in some way, shape, or form, no matter how many times the Doctor defeats them or how thoroughly dead they appear to be. The series will always make subtle references to its own history. If the Doctor makes a big deal about how wonderful some place or time is, something bad will be happening when he gets there (this is a somewhat common trope called tempting fate). If there are two one-off characters of opposite genders who are constantly bickering in the beginning, they’re actually in love and will figure that out at the end of the story. Not everyone who picks up this comic will go in with this kind of knowledge, but those who do will find the story somewhat predictable. A bit of predictability doesn’t ruin it, though. It still has everything that makes Doctor Who wonderful, it captures the Doctor’s characterization perfectly, and it offers an interesting look at the creative process behind comic books. “Truth is always stranger than fiction,” said the fictional character. It starts out with some panels that show obvious rip-offs of the Twelfth Doctor, his companion Clara, the Daleks, and the Master. 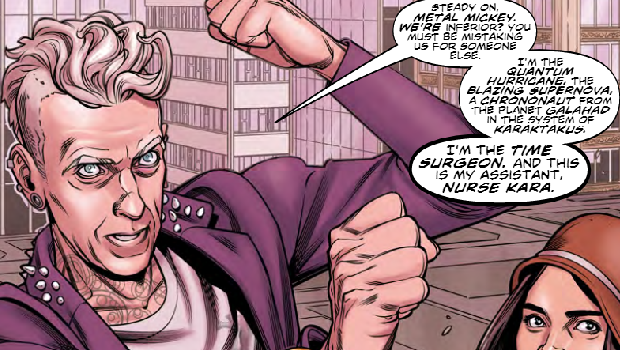 These are soon revealed to be a comic within the comic, and we are introduced to a writer named Sonny and an artist named Val, who have produced a “Time Surgeon” comic series based on in-universe Internet rumors about the Doctor (nod to the Season 27/Series 1 premiere, 2005’s “Rose”). On their way to a convention panel for Time Surgeon fans, the pair are whisked away by the Doctor, who has seen their work, noting that it’s based on himself, and finds it insulting. He wants to show them what an adventure in space and time really looks like. After visiting several different times (including an amusing reminder that the Twelfth Doctor speaks Dinosaur, as established in the Season 34/Series 8 premiere, 2014’s “Deep Breath”) and exotic planets (I particularly enjoyed the art of the Abraxas Manta Whales and the Doctor’s commentary on the creation of a new galaxy). Then the Doctor takes Sonny and Val to a planet called Zarma, which he says is a gathering place for the greatest creative minds in the universe. Unfortunately, when they arrive, many of those minds are being controlled by a species of hyper-rational brains in flying combat vehicles called Mindmorphs. As is tradition for multi-part Doctor Who stories, #2.14 ends on a cliffhanger. *The Third Doctor faced the Cybermen in other media, but not on TV; the Ninth Doctor has only faced the Cybermen in comics. **The Master had not yet been conceived as a villain during the First and Second Doctors’ tenures, did not appear during the Ninth Doctor’s season, and was only hinted at during the Eleventh Doctor’s third season. However, all other Doctors have faced the Master—most on multiple occasions. Without spoiling too much, #2.15 briefly shows the current and original versions of the Master side-by-side, three different versions of the Cybermen (including the original Cybermen from Season 4’s “The Tenth Planet”), the Eleventh, Tenth, and Ninth Doctors, some recent companions, and enemies from both Classic Who and New Who. The resolution seems a bit rushed and predictable, but the art is excellently done all the way through—especially the facial expressions. The characterization of the Doctor is consistent with what we’ve seen in the show, and overall, it really does feel like a condensed version of a TV episode. Nothing seems out of place, and the resolution makes sense with the facts that have been established within the issue. #2.14 was an excellent lead-in. It did a fantastic job of introducing this story’s one-off characters, their basic situation, and this story’s monsters. #2.15 would have been better if it was more evenly paced and had at least one or two major surprises, but it was still not bad at all.